No one should take this recent preponderance of salad posts as an indication that I will be changing the focus of my blog or the kinds of things I share here. I will not be giving up cake (or any of my other favorites...) anytime soon. I love cake! But the fact is, I love salad too. And while I have loved cake ever since I had the dexterity to get a fistful of it into my mouth, I have not always loved salad. This of course is no surprise to anyone who has visited my blog regularly over the years. I have written on several occasions about my change of heart towards vegetables, but salad in particular conjures up a vivid memory from my college years. Like most young women, I put an undue amount of mental energy into worrying about my weight. One time a friend and I were bemoaning the fact that we just didn’t like to eat in a way that would promote slimness (in the ignorance of youth, the more important consideration of good health was not yet in the forefront of our minds). Suddenly my friend said, "I want to be a 'salad person'—you know, one of those people who chooses to eat salad because they really like it!" If someone had told me then that I would not only come to like salad, but eventually truly love it, I would not have believed them. But then I hadn't been exposed to very many good salads. To me the word "salad" meant some sort of permutation of iceberg lettuce, shredded carrots, horse fodder-like nubbins of celery, hot house tomatoes, and stale packaged croutons...all glopped with bottled dressing. No wonder I didn't like it. My mother made a shredded carrot salad...and a Waldorf salad...that I liked, but in general my idea of salad was pretty limited...and not very favorable. It was something you ate because it was "good for you"....which as far as food descriptors go is the kiss of death in my opinion. But of course salad in its best form is the pinnacle of seasonal eating... of fresh and raw.... Salad is also about delicious variety. I could go on at great length about the wide array of foods that can be included in a salad... the essential textural and flavor contrasts... how to make a tasty homemade vinaigrette... And of course, I have done this very thing over the course of the past year. Whether you already love salad, or are just trying to like it, you should check out some of these old posts (you can find them by looking through the post titles in the side bar for this year, or by going to the salad section of my recipe index). The salad I'm sharing today is one I taught this month in a class devoted to the foods my family has traditionally had for our Christmas Eve dinner. Our menu has included a creamy and rich Wild Rice Soup since I was in grade school. This was served alongside a lovely wreath bread my mother started making when I was in college. There was also always a frozen cranberry "salad." It may or may not have included jell-o.... The only thing salad-like about this concoction was the ruffled lettuce leaf upon which the "salad" was placed. I deleted this item from the menu when I eventually took over holiday food preparation. I had never bothered to replace this dish because there is always so much going on Christmas Eve. But this year, I took the opportunity of the class to come up with something that was more to my liking. The Belgian Endive, Apple & Celery Salad I came up with is exactly what I'm craving this time of year. It is crunchy, tangy, juicy.... In a word: refreshing. It is the perfect antidote the all the heavy, rich and creamy things the holiday brings. Furthermore, the ingredients...and the beautiful monochromatic palette of colors....fairly shout "winter," making it a salad that is seasonal eating at its best. I love this salad. My class loved the salad. And my mother loved the salad. I will definitely be making it part of our Christmas Eve table from now on. But more than that, because it is so simple...and the ingredients are so easy to keep on hand...I will be making this salad regularly during the winter months. It really is the perfect winter salad—one that even non-salad people will probably like. 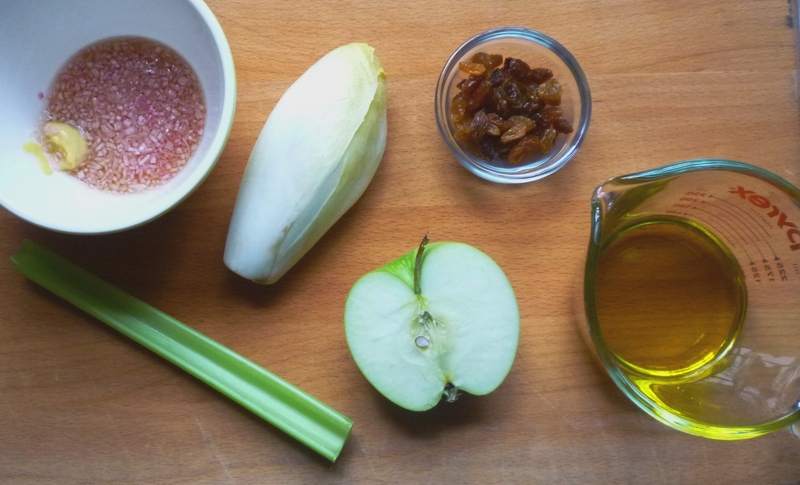 Make the vinaigrette: Place the vinegar in a small bowl with the shallots and salt. Set aside for five minutes or so to let the shallots soften a bit. Add the mustard and whisk until smooth. While whisking constantly, add the olive oil in a thin stream to form a slightly thickened, emulsified dressing. Taste and correct the seasoning with salt. Set aside. To make the salad, trim the ends away from the celery stalks. Using a vegetable peeler, remove any obtrusive strings from the outside of the ribs. Cut the stalks into 3 or 4 lengths. Slice each thinly to make a rough julienne of celery. Wash the apples. Halve each lengthwise and remove the cores. Using a mandolin slicer, slice each half thinly, lengthwise. Remove any bruised outer leaves of the endive and discard. Halve the endive and remove the cores (by cutting a "v" shape around the core on each half with the tip of a paring knife). Place each half face down on a cutting board and slice 1/3-inch thick on a long diagonal. 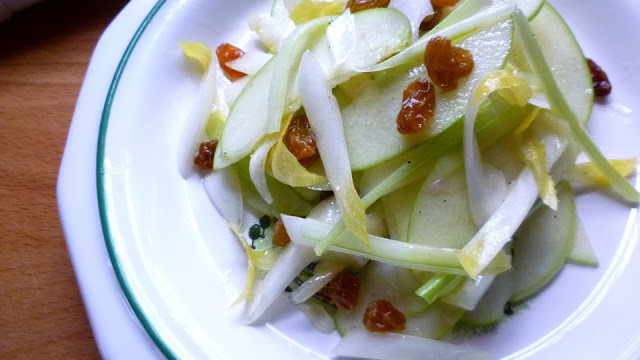 Place the celery, apples, endive and raisins in a large bowl. Drizzle with some of the vinaigrette (start with about 1/3 cup...you will probably need almost all of the vinaigrette, but it is better to start with less) and season well with salt and pepper. 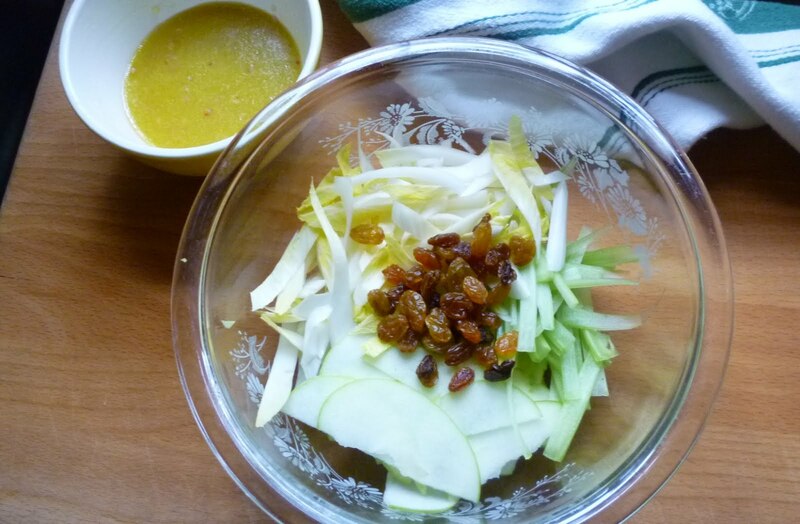 Carefully toss so that all of the ingredients are lightly coated with the vinaigrette. Add more vinaigrette as needed. Taste and correct the seasoning. If the salad seems well-seasoned and well-dressed, but still tastes a bit flat, give it a squeeze of lemon and toss again. It should taste lively and juicy. Mound the salad on a platter or divide among individual salad plates. Serves 6 to 8 as a first course or a side salad. Note: The celery may be cut ahead. 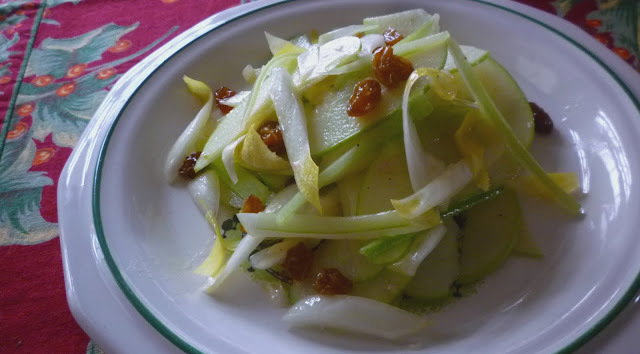 The apples and endive must be cut right before serving as they will both oxidize after being cut.